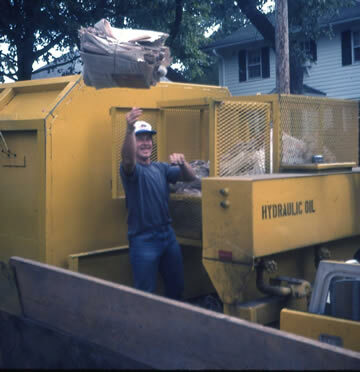 In September 1968, recycling started in Madison. This means we were the first community in the United States to offer curbside recycling services. Fifty years later, we're still recycling and still looking for ways to turn the material we no longer want into valuable resources. The City of Madison began recycling newspapers in September 1968. Residents had to leave bundled newspapers at the curb for pickup on their refuse collection day. The pilot program began after the US Forest Products Lab and the American Paper Institute approached the city in an effort to turn unwanted newspapers into a resource to make new paper. The program was a success. Two years later, the pilot program grew into a citywide program and eventually became mandatory on August 1, 1986. Paper was not the only material recycled. 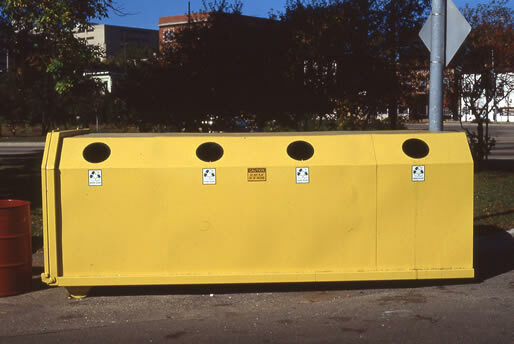 In the early 1970s, refuse was shredded before it was hauled to a landfill. 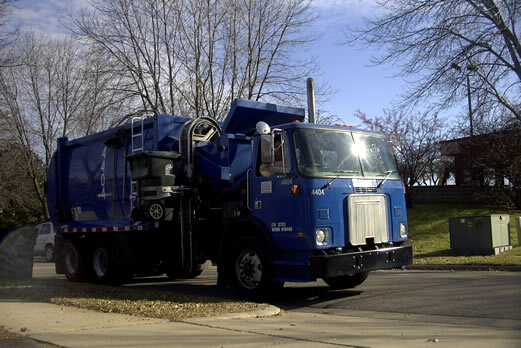 Starting in 1972, any metal items were pulled from the refuse prior to shredding. The metal was then hauled to local metal recyclers. 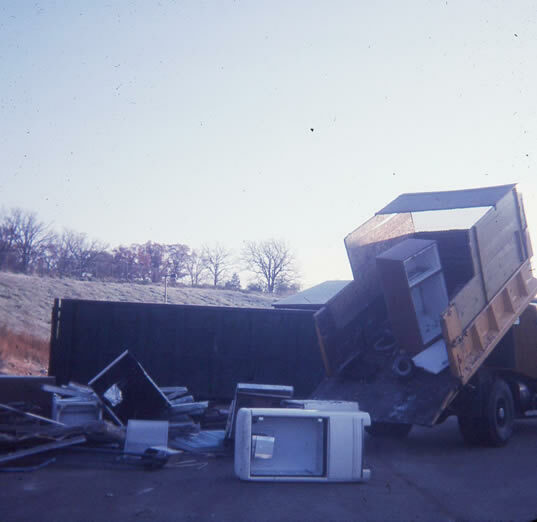 Four years later in 1976, a curbside appliance collection and recycling program began. Curbside collection and recycling of appliances continues today. In 1979, the City began a waste to energy program. The refuse collected by the City was separated at the processing facility at 121 E. Olin Ave. Recyclables were removed, which was just metal and some newspaper at the time. The remainder material was milled. The milled product was sent to Madison Gas and Electric and Oscar Mayer to burn for fuel. 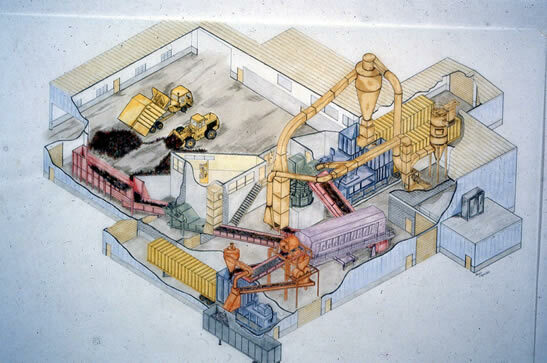 In 1994, due to changing markets and concerns about pollution, the waste to energy process ended, and the recovery machinery was removed. The processing facility was converted a transfer station (which is still used today) and refuse went back to the landfill without shredding or sorting. Yard waste is not something typically considered to be part of recycling, but it is. Yard waste (like leaves, grass clippings, etc.) is a valuable resource when recycled into compost. There's no reason to plug our landfills with it when it can return nutrients to our soil. And we have a lot of yard waste in Madison. 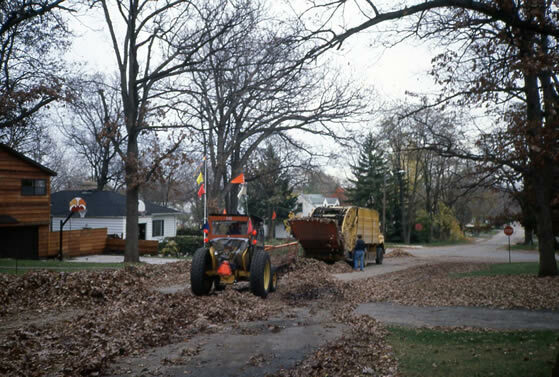 Beginning in 1980, a voluntary yard waste collection program began with the Streets Division delivering leaves to area farmers for composting. 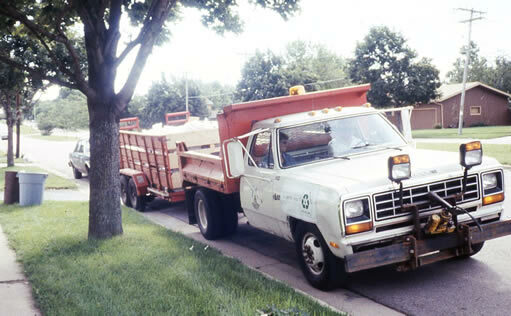 By 1989, the city began working to keep yard waste from entering the landfill. And In the early 1990s, yard waste became banned from landfills across Wisconsin. The desire to save usable material from being wasted in the landfill, and the law changes, lead Madison to the yard waste collection (and recycling) program we have today. 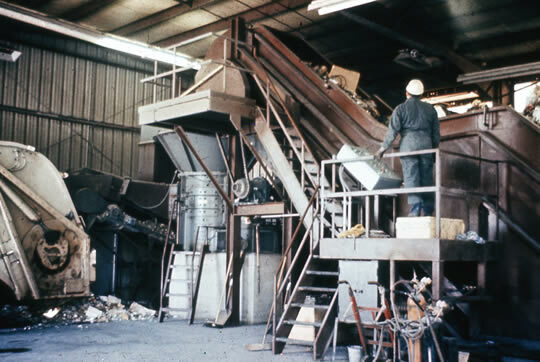 At the same time that metal began to be pulled from the refuse in the early 1970s, workers at the refuse mill removed brush from the garbage to be made into wood chips and mulch. 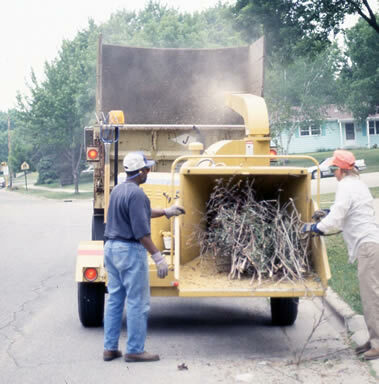 In 1976, regular curbside collection of brush began - which is well before the yard waste ban that started in the early 1990s. The curbside brush collection program continues today, and remains a popular and heavily used service. After nearly 20 years of only being able to recycle newspaper, a recycling program for glass began in 1987. However, glass recycling was not available for curbside collection like newspapers. Residents had to deliver their bottles and jars to a drop-off site. The Streets Division had 13 drop-off bins like the one shown below stationed around Madison to make recycling as convenient as possible. 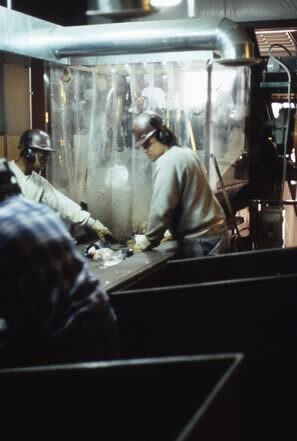 In 1989, which was just two years after the glass drop-off program started, there was opportunity to recycle more items. The City then expanded the items collected at these drop-offf sites to include aluminum, steel, and plastic containers.. The same year that drop-off recycling opportunities expanded to aluminum, steel, and plastic containers Madison started a pilot for curbside collection. 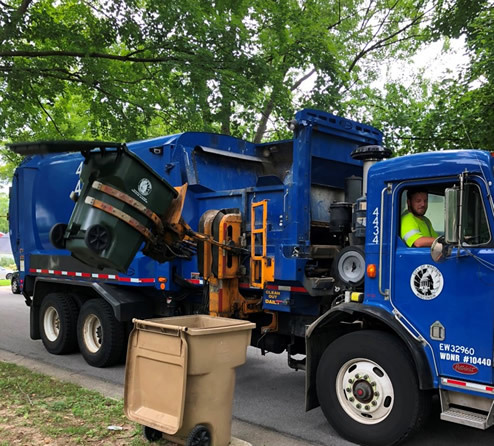 The pilot involved the City helping three community groups perform curbside recycling while the Streets Division performed its own pilot in other areas of the city. As the time, recycling had to be placed in clear plastic bags with newspapers still bundled outside of the bags. The pilot was a smashing success. 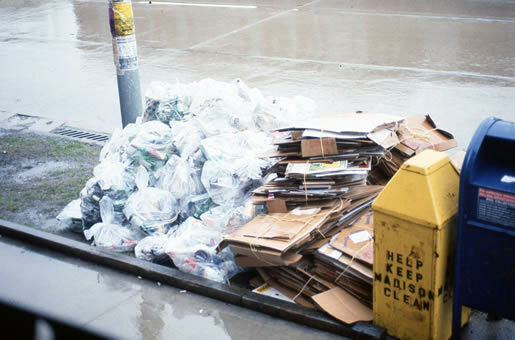 In 1991, mandatory curbside recycling began. The popularity of the curbside recycling program meant very few people used the recycling drop-off stations, so the 13 drop-off sites were reduced to the two drop-off sites we know and use today at 1501 W. Badger Rd and 4602 Sycamore Ave. The recycling collected by the Streets Division was hauled to a facility owned by Waste Management called the Madison Recycling Center. 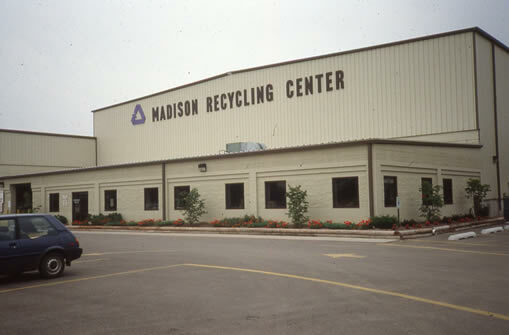 The Madison Recycling Center is a material recovery facility, or MRF, where the recyclables were removed from their bags and the items were separated into glass, plastic, metal, and paper bunkers. The process is very similar to the work performed today. Since 2012, Madison has worked with Pellitteri Waste Systems to sort the recyclables the City collects. While recycling in plastic bags at the curb made things much more convenient, it wasn't without challenges. Workers needed to pick up all these items by hand, which led to injuries. Plus, recycling the plastic bags that held the recycling proved difficult. The bags contained many beverage containers that were not fully empty or clean, which lead to a sticky residue that hurt the plastic recycling process. Electronics recycling is very important, and will only get more important as more electronics become part of our lives. Electronics can contain hazardous material like lead or mercury, and can also contain sensitive personal information on our computers and cell phones. Madison began a computer recycling program in 1998 with computer round up events. In 2008, the opportunity to recycle electronics with the City expanded. The occasional computer recycling events were replaced by year round drop-off sites where residents can recycle a great many of electronic items from small household batteries to bulky tube TVs. And once again, Madison was ahead of the curve. A statewide landfill ban on certain electronics was not instituted until 2010. When we think of recycling, it's understandable to focus on the stuff we can prevent from being sent to the landfill. But innovations are not restricted to just the material. Solving the problem of how to provide recycling services to everyone in a manner that is quick, easy, safe for workers, and cost efficient is a huge concern. In 2005, Madison took a big leap forward in addressing these problems. Starting in 2005, Madison began what's called "automated collection" of recycling. This is basically the same recycling collection method you see today. A collection vehicle with one operator pulls up to a stop, uses a robot arm to extend from the vehicle to grab a collection cart. The mechanical arm lifts the cart and dumps the contents into the top of the truck. Collecting recycling this way made the service much safer and faster for the work force. 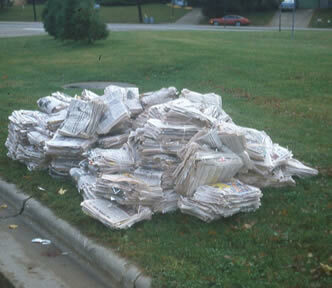 They no longer needed to lift heavy bags of mixed recycling and cumbersome bundles of newspapers. Automated collection makes recycling simpler for residents, too. More material can fit into a collection cart that could ever fit into a bag. Plus, having a cart means no more purchasing an extra special bag for recycling. Items can (and should) be dumped loose into the recycling cart for easy collection and sorting. 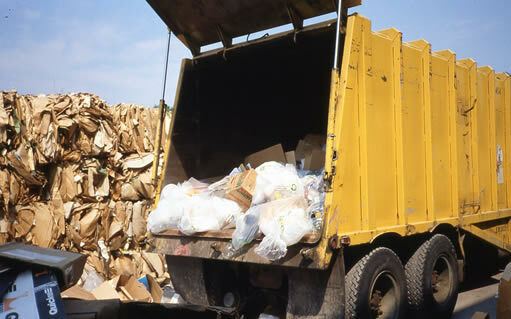 When looking to add new recycling material, the waste stream must be evaluated. The most important consideration is toxicity. If an item is toxic, finding those items a safe place for disposal is critical. Next, you consider the volume of the waste stream. If there is a lot of a particular item, it would be good to try to remove that bulk from the landfill and get it recycled. 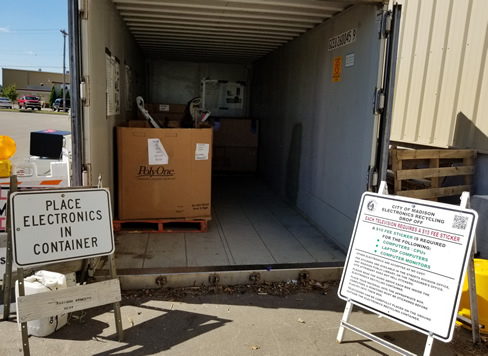 And third you want to be sure you have the opportunity and markets available to accept and process the item to keep it from the landfill (at an acceptable cost, of course). 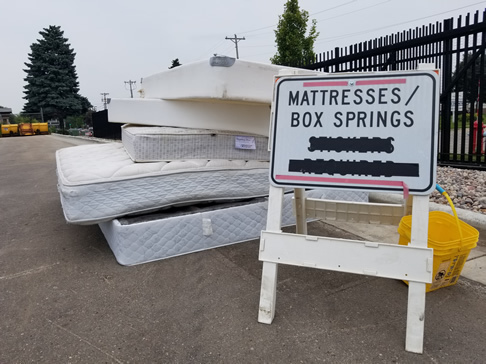 In 2013, the City started mattress recycling because while mattresses are not toxic, Madison disposes of thousands of mattresses each year, meaning the volume was definitely there. Mattresses use a lot of landfill space because they're big and they do not compact like other garbage. They are full of springs and foam after all - springing back up after being pressed down is exactly what they're supposed to do. And there was opportunity to have the items that make up mattresses recycled into new stuff (for example, mattress foam can be recycled into carpet padding). 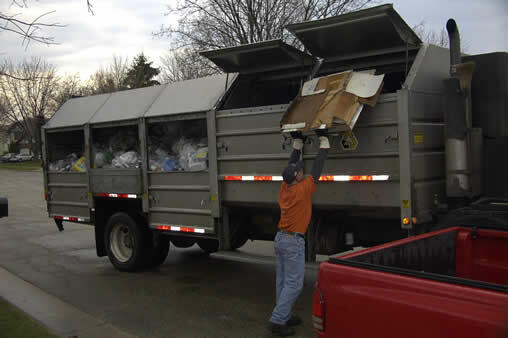 The next big thing for recycling in Madison will be food scraps. Food scraps and food-stained compostable paper make up about 25% of what we put into the landfill. And it can be recycled by turning it into compost. With the right technology, our unwanted food can be used to generate electricity or produce natural gas - and the byproduct would still be suitable for composting. A pilot program for food scraps started in 2011 and unfortunately ended in 2018, but the Streets Division remains committed to recycling this material not only to achieve goals laid out in Madison's comprehensive plan, but to continue the Streets Division's long history of diverting usable material from the landfill. Beyond food scraps, recycling will go through many changes. As the stuff in our lives changes, the ways and opportunities we have to process and reclaim resources from our consumer products will change. This is why knowing and following the recycling rules is so important. Recycling markets will change as well. Recyclable material is sold around the world and are subject to the same shifts, rises, and falls as other global commodities like oil. There is one constant in all this change: Madison will recycle. We will always work to find ways to take the items we no longer want or need and find ways to prevent those resources from being wasted.